The much-anticipated, long-awaited mobile version is here! Now you can choose a subscription type and access your data from any mobile device, anytime, anywhere you have cellular or wifi access. Import your Final Draft (.FDX) script into SavingFace and your breakdown is created automatically, saving you HOURS of tedious work! Learn how SavingFace works and get working smarter and faster! Want to take your business to the next level? Add Branding to your subscription and all your reports (makeup book included) will have your logo instead of the SavingFace logo. Stand out from the crowd and reinforce your own brand. 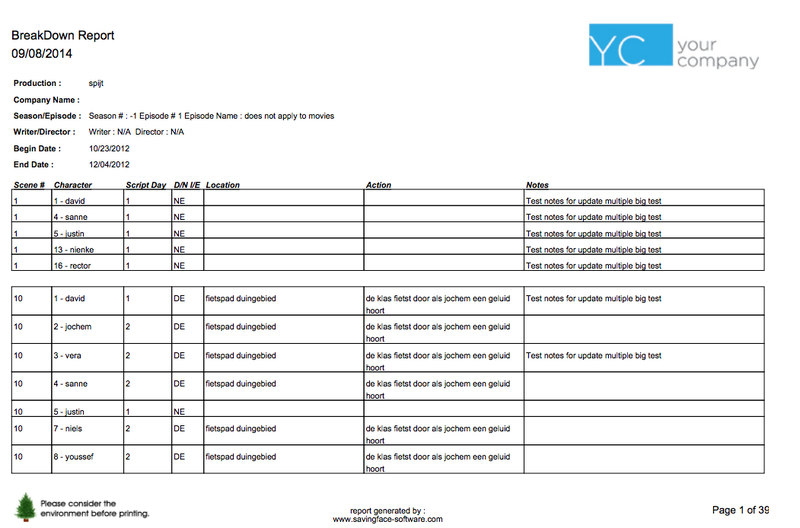 Keep everyone on the same page by dragging and dropping your day's scenes into call sheet order and you have a Daily Breakdown Report for easy reference! Register now to start saving time and money! 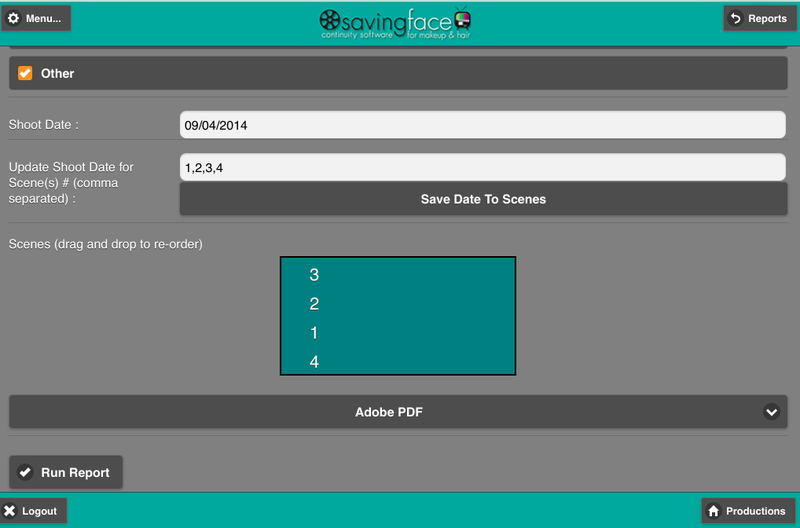 Get 2 free weeks of the full version of SavingFace so you can try before you buy! Convert your demo registration into a subscription within 1 week and we will convert your demo data into the full version. Contact us at info@savingface-software.com about purchasing the stand alone version. We are in the process of updating our new site to handle that checkout process. There are many reasons to choose SavingFace Software for your continuity needs. It's extremely affordable and flexible to meet your financial capabilities. Pay by the month or the year. Do you have a Final Draft script? You can import the script directly into SavingFace and save yourself days of tedious breakdown preparation! Print off your daily report for the scenes you are shooting today. You can order them before printing, so if scene 5 is being shot before scene 2, drag it to the top and then print. Need to email the day's shooting schedule to a team member or PA? No problem! Purchase Branding and now your logo is on your breakdown report for all to see. Submit your continuity book on a flash drive or email it! No more printing reams of paper and wasted ink. Think of the savings both $ and environment. 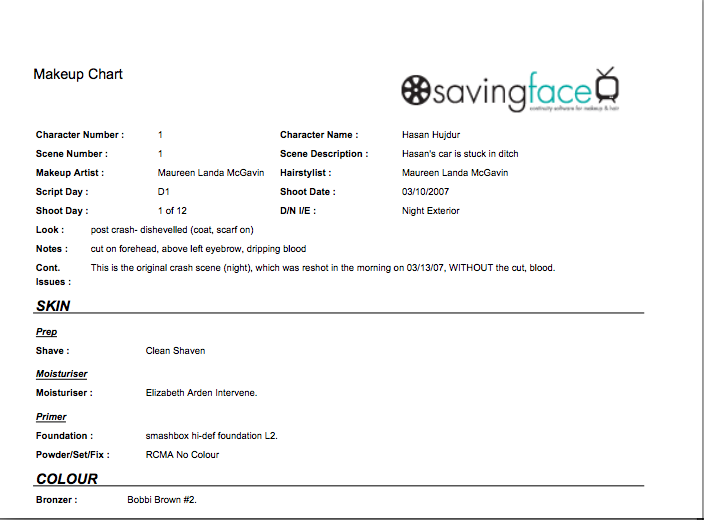 The Makeup Chart is the most comprehensive of the reports generated from your data in SavingFace Continuity Software. 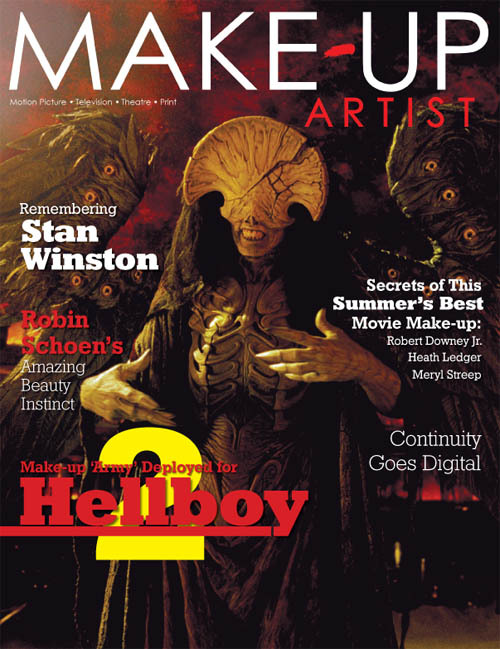 It comprises all of the makeup, hair, fx and photo records you enter for your characters. You can also generate more specialised reports, isolating specific sets of your data. Brigitte Wood - Los Angeles, CA,Thank you so much, the .pdf extension worked brilliantly and has given me a new appreciation for the software, the reports are exactly as we need them to be! Charles Gregory Ross - Atlanta, GA,I love it! A partial list of our credits. If you've used SavingFace on a production and would like to add it to our growing list of credits, please email info@savingface-software, with the word "Credit" on the subject line. 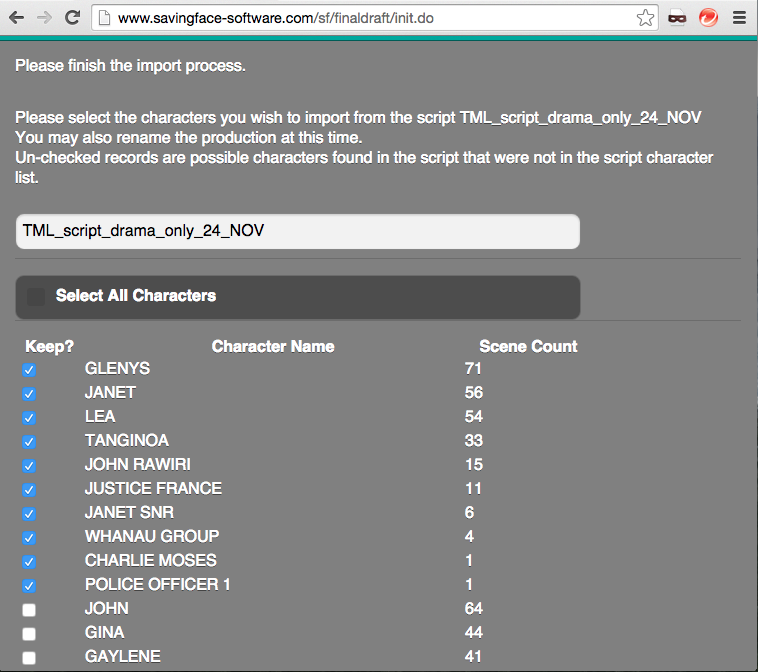 Now you can securely import characters and scenes from your .FDX (Final Draft) scripts and have your breakdowns done for you- automatically! Save yourself hours of manual entry of script information. Q: Why do I need continuity software? 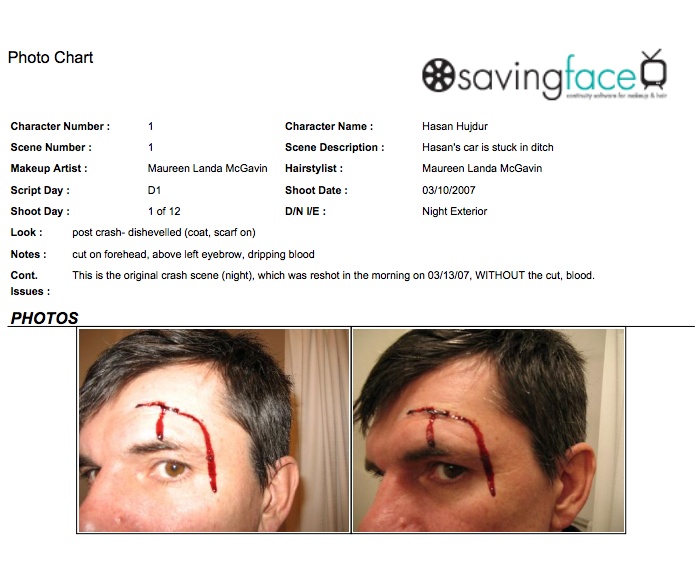 A: SavingFace was developed as an alternative to the old school "makeup charts" and "continuity books" compiled in the makeup and hair department. All your continuity photos and data are saved digitally on your computer, eliminating the need to copy details long hand, print photos and save pages in plastic sleeves in heavy, cumbersome binders. The software can generate reports that replace the makeup charts, detail any continuity issues that are noted and the entire "book" can then be saved on your hard drive and you can hand Production a digital "book" on a CD- or better yet? Email your entire Book! No more printers, ink, batteries, or photo paper necessary. The software saves your data and photos as well as saving money, paper and power- an added bonus for those of us concerned about doing our part to offset our carbon footprints. Q: Can I email charts, reports or pictures from the software? A: Yes. The makeup charts are in PDF format, include the pertinent photos and can be attached to any email message. Therefore, any information you need to share with your team can be exchanged through email. Q: I'm really just a one-man department, working on really small low-budget films. I'm the one doing makeup and hair- I almost never have an assistant. Why would I need this software? A: This software is especially beneficial to an artist in your position. You have to keep all your own continuity notes anyway, the "match to scene" and "merge" functions will save you valuable time- allowing you to copy and paste data from one scene to another and from one character to another in the same scene. Want to save yourself untold HOURS of work? Use the Automatic Script Import function! Not having to print photos saves you having to run a printer and use expensive photo paper and ink cartridges, saving your department's budget a lot of money that could well be spent elsewhere. Want to take your business to the next level? Add Branding to your subscription and all your reports (makeup book included) will display your logo in place of the SavingFace logo! Stand out from the crowd and reinforce your own brand. Want your team prepared for each shooting day? Keep everyone on the same page by dragging and dropping your day's scenes into call sheet order and you have a Daily Breakdown Report for easy reference. SavingFace Software does not store any credit card or bank information of any kind. Your information is private and secure. We do not sell or rent your information to anyone. You may cancel your monthly subscription at anytime. You may cancel your annual subscription at anytime but will incurr a one month subscription fee payment. In other words if you have 4 months left on your subscription we will refund 3 months worth of the annual fee.